Submitted art A painting by Christine Klinger. 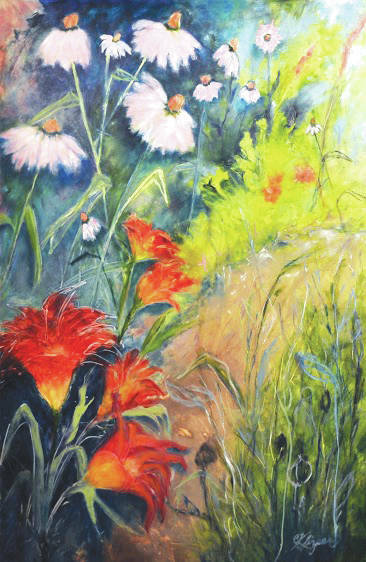 YELLOW SPRINGS — The Yellow Springs Arts Council is hosting “Into the Garden” — new work by local artist Christine Klinger — beginning Friday, Aug. 17 through Sunday, Sept. 16 at the Yellow Springs Arts Council Gallery, 111 Corry St. Vibrant visions of gardens-color soaked flower gardens and lush water gardens, Klinger portrays them intuitively through a variety of materials on various textured surfaces. She has a masters degree in photojournalism from Ohio University in Athens and has written and photographed for publications. She has also taught photography, sculpture and painting in art centers and colleges in Ohio, South Carolina and California. From 1996-2005 she coordinated the Rosewood Gallery in Kettering and later owned and operated Springs Gallery in Yellow Springs. Klinger is currently a member of Village Artisans Cooperative in Yellow Springs. Her work can be seen online at www.klingerart.com and www.klingerstudios.blogspot.com. The opening reception is slated or 6-9 p.m. Friday, Aug. 16 at the gallery. https://www.fairborndailyherald.com/wp-content/uploads/sites/50/2018/08/web1_KlingerArt.jpgSubmitted art A painting by Christine Klinger.